Perhaps you heard about the recent report that parents and children both prefer books on paper to e-books when reading together. I suspect that if you’re above a certain age, you found this news to be an encouraging reaffirmation of your values, otherwise known as curmudgeon-hood. Conventional (read “elderly”) wisdom has it that paper is a more “warm and nurturing” medium than an electronic device. I agree, at least for the time being. 1. Grasp the right-hand page, usually at the corner, by separating the top sheet from those underneath. 3. Drop the page and smoothe it. 1. Swipe the screen or press a button. That’s it. Can a child do this easily? Probably. So in terms of ease of use, the electronic book wins “hands down.” But in terms of physical interaction, paper provides the reader with sensations on more than one level. Electronic pages feel the same to your touch whether they’re displaying War and Peace or The Poky Little Puppy. In tactile variety, paper is the clear winner. Different paper books have different size pages, using paper of different weights and degrees of opacity. And who has not noticed and enjoyed a “new book smell?” As a result, a paper page turns with more fanfare and tactile feedback than an electronic page. So much so that learning the skill of paper-turning can give a young child a sense of accomplishment, an added positive association. Of course, the relative advantages of the two media will likely change as technology improves. Already e-books provide color, a major shortcoming of early devices, and full-blown Search features. But I’d say the jury is still out on the hyperlinks that e-books make possible. Although they have the potential to enrich text, hyperlinks can also distract viewers with games and activities of dubious value. As a result, e-books are just as likely to detract from a good story as to make it better. The complex positive associations that many of today’s parents have with the books of their youth prejudice them in favor of paper. The above study also found that 60% of parents prefer that their children read from paper rather than glass. But who knows? Twenty years from now when today’s children, who are more familiar and comfortable with technology of all kinds, become parents, they might prefer e-books. And then the definition of “warm and nurturing” will change, despite what the old folks think. Until then, though, let your child be your active reading partner. 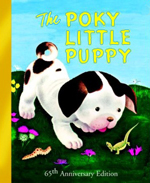 Together enjoy the feeling of lifting each page to see what that precocious puppy is going to do next. Paper or glass? What’s your preference for your own reading? For reading with your child? A blue whale typically spends 10 to 12 months in the womb; an elephant about 22. So are you surprised to hear that it took author/illustrator Chris Raschka 10 years to create the 32-page picture book A Ball for Daisy. Many people assume that creating a children’s picture book is a relatively simple matter. For the writing, come on–500 to 1,000 words–how long could that take? An afternoon, a weekend, maybe. Certainly no more than a week. Still, 10 years for a storybook for little kids? And did I mention there are no words in this particular book. What could possibly have taken so long? Any book of this type has technical demands. Here, it was the desire to tell a story solely through a dog’s face and body. But even more difficult was the need to convey emotions to an audience that has very limited experience with them. A Ball for Daisy is about loss, which can be especially devastating to a preschooler who likely doesn’t understand its irreversibility. Raschka could have “explained” it all, but let’s face it, explanations don’t make loss any less painful for those of us old enough to be familiar with it. Instead, A Ball for Daisy, shows subtly and reassurringly that although the loss of something beloved can leave a hole that can’t be filled, it also can lead to a new appreciation and joy for what remains, whether it’s already known or is yet to be discovered. Finding a way to give a three-year-old hope–in pictures alone–isn’t something that you can figure out overnight. In fact, I’m surprised it only took 10 years.